The problem with clowns is that it’s easy to dismiss them as a joke — but if you do that with Insane Clown Posse, then the joke’s on you. With record sales in the multi-millions and a loyal fanbase that is comparable only to that of the Grateful Dead, the Juggalo juggernaut has been trucking for 25 + years, and shows no sign of slowing down. Much maligned and misunderstood, the band and the fan-created “Juggalo” world that surrounds them, are steeped in controversy — much of it being caused perhaps by over-literal interpretations of their tongue-in-cheek horrorcore lyrics. However, despite much-publicized brushes with the law, for many in the Juggalo community, Insane Clown Posse’s Violent J and Shaggy 2 Dope are seen as saviors rather than sinners — their inclusive philosophy serving as a lifeline. Very much in sympatico with the ethos of SuicideGirls, those in Insane Clown Posse’s world celebrate the strange, the weird, and the fucked up — and have an innate understanding that it’s these differences which make us beautiful. The Gathering of the Juggalos serves as a visceral illustration of this. Now in its 17th year, the Lollapalooza-like event — which takes place this year from July 20th thru 23rd at Legend Valley in Thornville, Ohio — is a family reunion for the disenfranchised and a festival for those from all walks of life who feel a need to get their freak-on. 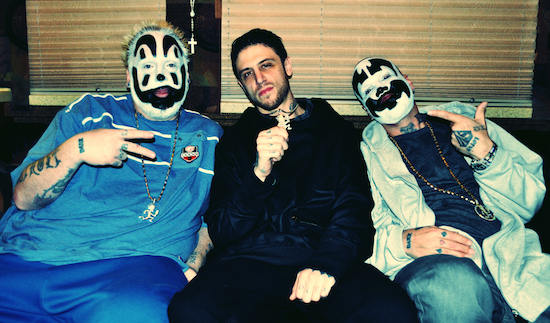 Earlier this year, SuicideGirls caught up with Violent J (left), Shaggy 2 Dope (right), and Young Wicked (center) on their tour bus, in a nondescript parking lot somewhere near LAX. Read the full interview here.